The haze in the picture isn’t effect, it’s smoke! Before you read our post about the above picture, you have to hear the background. I was feeling pretty sad about my mixer since I’ve had it for as long as I can remember. I needed to write a post, so in an effort to lift my spirit, I decided to write a parody about it. Those who know me, know that this is one of my quirky ways of humoring myself–and it usually works. I didn’t think Tom would actually let me post this, since I was playing around not really being serious. A couple of minutes ago, (it’s 9:52p on Monday night) I told Tom that I didn’t think he would let me post what I had just written–a parody about my mixer. He started laughing from the kitchen telling me to come see what he was doing. He was on Craig’s List looking for a replacement mixer for me. 🙂 We laughed and decided to share my little song with you. I guess having only a couple more pieces of pie in the fridge is countdown enough for him. We’d be fat and happy for awhile. The day my mixer D.I.E.D. 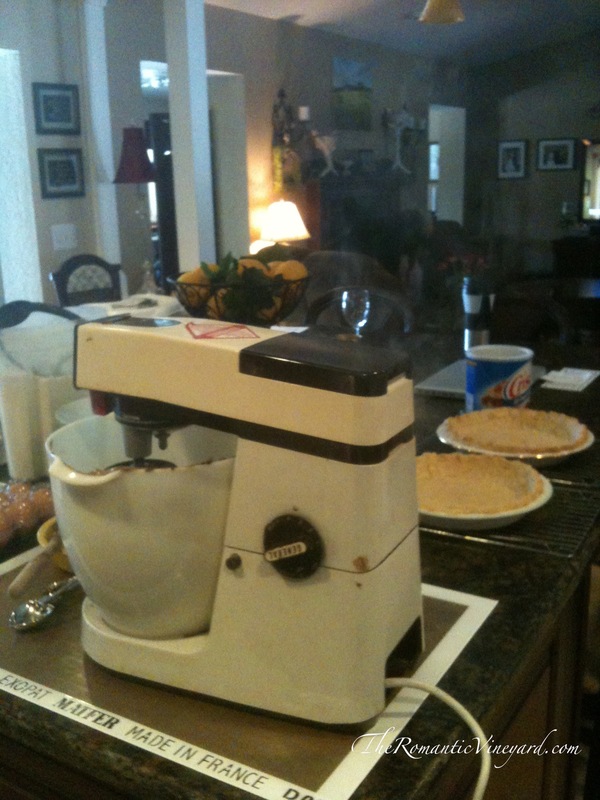 This entry was posted in Christian Marriage, humor and tagged American Pie by Don Mclean, commercial mixer, parody. Bookmark the permalink. Did somebody say “pie”??? Yes please! And I hope the new mixer is as well made as the old mixer! Me, too, Jason. But I don’t think they make them like that anymore. Besides, it was a real commercial counter-top mixer Tom rebuilt for me from his work. But whatever I get will be better than nothing. Pies are sure addicting. Thanks for stopping by and lamenting with me. I’ll never burn up another appliance without thinking of you! That’s so cute! I hope your new mixer brings lots of yummy memories too. Oh so do I. Thanks for commenting. Mel, I tried that for your 40th BD remember? Loved it you crack me up. That is so cleverly funny! Debi – thanks for the laugh!